U.S. Bank Stadium is an enclosed stadium in Minneapolis, Minnesota, United States. Built on the former site of the Hubert H. Humphrey Metrodome, the indoor stadium opened in 2016 and is the home of the Minnesota Vikings (NFL); it also hosts early season college baseball games of the University of Minnesota Golden Gophers (NCAA). The Vikings played at the Metrodome from 1982 until its closure in 2013; during construction, the Vikings played two seasons (2014, 2015) at the open-air TCF Bank Stadium on the campus of the University of Minnesota. The team's first home was Metropolitan Stadium in Bloomington (1961–1981), now the site of the Mall of America. On June 17, 2016, U.S. Bank Stadium was deemed substantially complete by contractor Mortenson Construction, six weeks before the ribbon-cutting ceremony and official grand opening on July 22. Authority to use and occupy the stadium was handed over to the Vikings and the Minnesota Sports Facilities Authority. The Vikings played their first pre-season game at U.S. Bank Stadium on August 28; the home opener of the regular season was in week two against the Green Bay Packers on September 18, a 17–14 victory. It is the first fixed-roof stadium built in the NFL since Ford Field in Detroit, which opened in 2002. As of March 2015, the overall budget was estimated to be $1.061 billion, with $348 million from the state of Minnesota, $150 million from the city of Minneapolis, and $551 million from the team and private contributions. U.S. Bank Stadium hosted Super Bowl LII won by the Philadelphia Eagles on February 4, 2018, the ESPN X Games on July 19–22, 2018, and the NCAA Final Four won by the Virginia Cavaliers on April 6–8, 2019. The stadium is also expected to host the 2020 NCAA Division I Wrestling Championships. From directly east of the stadium: the southeast facade with doors and windows going in, as well as the northeast facade with part of its exterior wall up. While the Vikings' owners wanted an outdoor stadium, the state and local governments would only provide funding for an indoor stadium capable of hosting major events like the Super Bowl and the Final Four. A retractable roof, the trend in 2010s football stadiums, would have been too expensive. Architecture firm HKS, Inc., also responsible for the Dallas Cowboys' AT&T Stadium and the Indianapolis Colts' Lucas Oil Stadium, decided to go for a lightweight translucent roof and glazed entrances with giant pivoting doors, aiming to get as much natural light from the outside as possible. The roof is made up of 60% Ethylene tetrafluoroethylene (ETFE), a fluorine-based clear plastic, and is the largest in North America, spanning 240,000 square feet (22,000 m2) supplied and installed by the firm Vector Foiltec. ETFE's low R-factor and the roof's slanted design, inspired by Nordic vernacular architecture, allows the stadium to endure heavy snow loads. Snow accumulates in areas that are more safely and easily accessible, and also moves down the slanted roof into a heated gutter, the water from which drains to the nearby Mississippi River. The translucent roof and large wall panels also give fans a view of downtown Minneapolis. The glass operable wall panels will allow the stadium to experience some of the outdoor elements while providing protection from the snow, rain, and the cold winter weather. The stadium is aligned northwest and the elevation at street level is approximately 840 feet (255 m) above sea level. Years before construction began on the stadium, local and national conservation groups - including the Minnesota Department of Natural Resources and the Audubon Society - requested a "bird-friendly" design of the stadium's exterior using slightly less transparent bird-safe glass. Designers ignored the advice and instead used highly reflective glass for aesthetic reasons. The reflective glass, combined with the stadium lying along the Mississippi Flyway migration route, has resulted in a large number of bird deaths, double any other building in Minneapolis. A "bird fatality study" being financed by the Vikings and the Minnesota Sports Facilities Authority is expected to be completed in 2019. If changes are made, it will now cost about $10 million to replace the existing glass with bird-safe glass rather than the $1 million it would have added to the original construction. The design for U.S. Bank Stadium has been compared to the Crystal Cathedral in southern California, which was created by architect Philip Johnson. Opened in 1980, Crystal Cathedral was previously considered America's largest glass-dominated building. [clarification needed] The stadium, which likewise sports transparent roofs, walls, and giant rotating doors, has the world's five largest pivoting doors. The seating capacity is 66,860 for most games, slightly more than the Metrodome, and can be expanded to 73,000 for soccer, concerts, and special events, such as the Super Bowl. The Vikings' lease with the Metropolitan Sports Facilities Commission (MSFC), as signed by both parties in August 1979, kept them in the Metrodome until 2011. The lease was considered one of the least lucrative among NFL teams; it included provisions where the commission owned the stadium, and the Vikings were locked into paying rent until the end of the 2011 season. For several years prior to the Metrodome's demolition, however, the Metropolitan Sports Facilities Commission waived the team's nearly $4 million rent. The Vikings paid the MSFC 9.5% of their ticket sales; the commission "reserve[d] all rights to sell or lease advertising in any part of the Stadium," the team could not use the scoreboard for any ads, and the team did not control naming rights for the building. Though the Vikings received revenue from the sale of luxury suites during the Minnesota Twins baseball season (a contributing factor to the Twins leaving the Metrodome for Target Field in 2010), the commission controlled the limited parking and its revenue and paid the team 10% of all concession sales while retaining roughly 35% of concessions sold during Vikings games. The Vikings were 30th out of 32 NFL teams in local revenues in 2005. The Vikings, as well as the stadium's other tenants, continually turned down any proposals for renovating the Metrodome itself. A plan for a joint Vikings/University of Minnesota football stadium was proposed in 2002, but differences over how the stadium would be designed and run, as well as state budget constraints, led to the plan's failure. The university would eventually open its own TCF Bank Stadium in 2009. From the outset, Zygi Wilf, a billionaire from New Jersey and principal owner of the Vikings since 2005, had stated he was interested in redeveloping the downtown site of the Metrodome no matter where the new facility was built. Taking into consideration downtown Minneapolis' growing mass transit network, cultural institutions, and growing condo and office markets, Wilf considered underdeveloped areas on Downtown's east side, centered on the Metrodome, to be a key opportunity and began discussing the matter with neighboring landholders, primarily the City of Minneapolis and the Star Tribune. An unrelated 2008 study explains that the effect of the media, in this case an uncritical Star Tribune, matters a great deal in helping a stadium initiative. As a result, once negotiations for a different location had been put aside, the Vikings focused on proposing a stadium that would be the centerpiece of a larger urban redevelopment project. Wilf's Vikings began acquiring significant land holdings in the Downtown East neighborhood around the Metrodome. In June 2007, the Vikings acquired four blocks of mostly empty land surrounding the Star Tribune headquarters from Avista Capital Partners (the private equity owner of the Star Tribune) for $45 million; it is also believed the Vikings have first right of refusal to later buy the paper's headquarters building. In May 2007, the Vikings also acquired three other downtown parking lots for a total of $5 million, and have made a bid for a city-owned, underground parking ramp next to the neighborhood's light rail station. On April 19, 2007, the MSFC and the Vikings unveiled their initial plans for the stadium and surrounding urban area, with an estimated opening of 2012. The plan included substantial improvements to the surrounding area, including an improved light rail stop, 4,500 residential units, hotels with a combined 270 rooms, 1,700,000 square feet (160,000 m2) of office space and substantial retail space. As of 2007, the stadium would have held approximately 73,600 people and was to have been complete by August 2011. The initial proposal did not have the final architectural design renderings, but did include key features that were to have been included in any final plan, including the plans for neighboring urban development. These included demands for a retractable roof, an open view of the surroundings (particularly the downtown skyline), a glass-enclosed Winter Garden alongside the already-existing adjacent Metrodome light-rail stop, leafy urban square with outdoor cafés and dense housing around its edges, aesthetic improvements to roads connecting the stadium to nearby cultural institutions, and adaptive reuse of neighboring historic buildings. The roof would have allowed Minneapolis to remain a potential venue for the Super Bowl and Final Four, both of which had been held at the Metrodome. The proposed urban plan itself was received with cautious welcome. The 2007 proposed cost estimate for the downtown Minneapolis stadium was $953,916,000. The total broke down to $616,564,000 for the stadium, $200,729,000 for a retractable roof, $58,130,000 for parking, $8,892,000 for adjacent land right-of-way, and $69,601,000 to take into account inflation by 2010. The estimate compared to then-upcoming stadiums in Indianapolis at $675 million (retractable roof, completed 2008), Dallas at $932 million (retractable roof, completed 2009), and New York at $1.7 billion (open-air, completed in 2010). In addition, according to Wilf, taking into account the costs for the surrounding urban developments put forth in the proposal would have brought the estimated total to $2 billion. The estimated costs were based on projected 2008 construction and material costs, so it would have been possible that the stadium costs could have hovered near $1 billion if the Minnesota State Legislature had not approved the project in the 2008 session. No proposals were made, at that time, for paying for the stadium. The MSFC and Vikings made initial pitches to the Minnesota State Legislature during the end of the 2007 session, but expected to make serious efforts during the 2008 legislative session. The Vikings proposed creating a Minnesota Football Stadium Task Force, which they expect would take 24 months to plan the stadium. Following the September 2008 MSFC vote to start feasibility studies for re-using the Metrodome, an unrelated study released for 38 U.S. cities found that "when a [NFL] team wins, people's moods improve," and that personal income for residents of a city with an NFL team with 10 wins increases about $165 per year. While true for NFL football, for comparison, professional baseball and basketball gain no personal income for residents. Feasibility studies for Dallas-based design and local construction of a new stadium were expected in early 2009. Roy Terwilliger, a former Republican state senator from Edina, Ray Waldron, an AFL-CIO leader, and the Dome engineering expert and CEO, Bill Lester and Steve Maki of the MSFC selected architectural firm HKS of Dallas and construction manager Mortenson of Minnesota over the objections of Paul Thatcher and Timothy Rose of Minneapolis-St. Paul, who preferred Ellerbe Beckett and Kraus-Anderson, both of Minnesota. Loanne Thrane of St. Paul, the sole female member of the commission, voiced opposition and later voted with the majority. In December 2009, commission chairman Terwilliger said, "We know what the art of the possible is at this particular location." A new proposal for 65,000 seats with a sliding roof was unveiled at $84 million less than the previous proposal, but with $50 million per year more scheduled for each year that construction is delayed. Vikings officials boycotted the presentation which estimated the total cost at $870 million, or $770 million if the sliding roof were omitted. The 2010 Vikings stadium proposal was dealt a setback on May 5, 2010, when a Minnesota House panel defeated the proposal by a 10–9 vote. The stadium debate was revived in the aftermath of the Metrodome's roof deflation on December 12, 2010, which forced the relocation of the Vikings' final two home games of the 2010 season and led to more calls for a new stadium from various sources in the local and national media. Minnesota Governor Mark Dayton discussed the matter with NFL commissioner Roger Goodell, but said "any new stadium must first benefit the people of Minnesota". After Hennepin County stopped their pursuit of a Vikings stadium, the city of Minneapolis submitted a plan for a Vikings' stadium at the downtown Metrodome site. The Minneapolis plan was for a fixed-roof stadium costing an estimated $895 million. The proposal also included funding solutions for $95 million in renovations to the Target Center. The team reacted with skepticism to the proposal and did not want to play at nearby 50,000-seat capacity University of Minnesota TCF Bank Stadium during the three years of construction. Because the Minneapolis dome site was a less expensive option, football fans were expected to return to the Minneapolis plan if the shortfall in the Ramsey County plan were not realized. In May 2011, Ramsey County officials announced they had reached an agreement with the Minnesota Vikings to be the team’s local partner for a new stadium, subject to approval by the Minnesota Legislature and to approval of a sales tax by the Ramsey County Board. 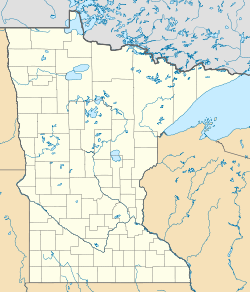 The site of the stadium would be the former Twin Cities Army Ammunitions Plant in Arden Hills, which is about 10 miles from the Metrodome in Minneapolis and is a Superfund clean up site. The agreement called for an $884 million stadium and an additional $173 million for on-site infrastructure, parking and environmental costs. Ramsey County said the Vikings would commit $407 million to the project, which would have been about 44% of the stadium cost and 39% of the overall cost. The county's cost would have been $350 million, to be financed by a half-cent sales tax increase. The state of Minnesota's cost would have been $300 million. This totalled about $1.057 billion, leaving at least a $131 million shortfall. On March 1, 2012, Governor Dayton announced an agreement for a new stadium to be built on the site of the Metrodome, pending approval by the state legislature and the Minneapolis city council. The $975 million project, half of which would be publicly funded, would be patterned after Lucas Oil Stadium. It would utilize part of the footprint of the Metrodome and would only require the Vikings to play at TCF Bank Stadium during the final year of construction. The agreement met with mixed reaction, and some criticized the proposal as being unfair to taxpayers and a giveaway to team owners. On May 10, 2012, the Minnesota Legislature approved funding for a new Vikings stadium on that site. The project is projected to have a $975 million price tag, with the Vikings covering $477 million, the state covering $348 million, and $150 million covered by a hospitality tax in Minneapolis. The city of Minneapolis must pay a total of $678 million over the 30-year life of the deal, including interest, operations, and construction costs. The bill was signed by Gov. Dayton and received the approval of the Minneapolis City Council on May 25, 2012. The Vikings played in the Metrodome through the 2013 season, as construction did not require the dome's immediate demolition. Under the leadership of Vikings COO Kevin Warren, the team moved to TCF Bank Stadium on the University of Minnesota campus until the new stadium was completed. On May 13, 2013, the Minnesota Sports Facilities Authority (MSFA), the Minnesota Vikings, and HKS Sports & Entertainment Group together unveiled the new stadium's design. In January 2014, a lawsuit was started by former Minneapolis mayoral candidate Doug Mann and two others to block the construction of the new stadium. The suit questioned the constitutionality of the stadium's funding plan and delayed a $468 million bond sale. Officials warned the delay could stall the project's timeline and add costs. The lawsuit was later dismissed by the Minnesota Supreme Court. The State of Minnesota's portion of the cost of the stadium was to be funded by revenue from a proposed new charitable gambling source, which was dubbed electronic pulltabs. When the stadium funding bill was passed in the legislature and signed by the governor on May 14, 2012, the new revenue from the games was estimated to be $34 million for 2013, and rising each year thereafter. Six months later, the first budget estimate from the Minnesota Office of Management and Budget was released, revising the projected revenue from the electronic pulltab games. This first revision cut the estimated revenue from the game for 2013 by 51%, to $16 million (versus the legislation's estimate of $34 million). From page 15 of the Minnesota Management and Budget Complete Forecast, November 2012: "For FY 2013, the projected reserve balance has been reduced from $34 to $16 million. Projected new gambling revenues from stadium legislation are expected to be $18 million (51%) below end of session estimates." "The forecast reduction reflects a slower than expected implementation of electronic gaming options and reduced estimates for daily revenue per gaming device." In March 2013, the Minnesota Office of Management and Budget released another updated budget forecast for fiscal years 2013 to 2017. Included in this forecast was another revision in the projected revenue from charitable gambling sources, from the previous estimate of $16 million, down to $1.7 million, a further 90% reduction in the estimate for 2013 revenue. This total was a 95% reduction from what was estimated in the stadium bill passed in May 2012. From page 12 of the Minnesota Management and Budget Complete Forecast, February 2013: "The forecast for lawful gambling revenue has been reduced $15 million in FY 2013 and $46 million in FY 2014–15. Slower than expected implementation of electronic gambling options and a reduction in estimates for daily revenue per gambling location were the reasons for the revenue reduction". As a result of the projected shortfall, members of the Minnesota Legislature and the Governor's office began discussing ideas to fix the shortfall. The legislature decided to impose an inventory tax on cigarettes to make up for any shortfall over the next year of construction and closing of a corporate income-tax loophole for the following years. The state reported in July 2016 that pulltab revenue is "soaring" and that there is optimism in Minneapolis about its continuing to rise. 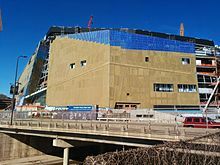 Wikimedia Commons has media related to Construction of U.S. Bank Stadium. In August 2012, the Minnesota Sports Facilities Authority (MSFA)—the stadium's newly created owner—received bids and plans from five architectural and engineering firms, all nationally recognized stadium designers, including Populous, AECOM, EwingCole, and HNTB. On September 28, 2012, the MSFA selected the Dallas firm of HKS, Inc., which had designed both AT&T Stadium and Lucas Oil Stadium within the previous decade, to serve as the project's architect. HKS also designed Globe Life Park in Arlington, home of the Texas Rangers; the Milwaukee Brewers’ Miller Park in Milwaukee, Wisconsin; and renovations to the Chicago White Sox’s Guaranteed Rate Field. Initial design plans were not immediately released to the public, but Viking officials said they hoped the budget would allow the new stadium to include a retractable roof, walls, or windows. The design team also planned to incorporate interactive technology into some elements to create a more engaging fan experience. Construction of the facility was originally slated to begin in October 2013, but was delayed until December 3, 2013, as an ongoing investigation of the Wilfs' finances continued to take place after a 21-year lawsuit against them came to a conclusion in late August. On August 27, 2015, one worker died and another was injured after falling during construction on the U.S. Bank Stadium roof. Jeramie M. Gruber, 35, of Northfield and the other injured worker were employed by St. Paul-based Berwald Roofing Co. which had been cited 6 times since 2010 for OSHA violations regarding improper fall protection for workers. The Occupational Safety and Health Administration (OSHA) investigated the incident. As a result of the investigation, contractor Mortenson Construction and subcontractor Berwald Roofing faced fines of $173,400 for "serious" and "willful" safety violations. The reports do not provide an explanation of the accidents, but the largest fine, $70,000, and most serious alleged violation faults Berwald for willfully failing to have workers use proper fall protection while working at heights above 6 feet. On June 15, 2015, the Vikings announced that U.S. Bank had acquired the naming rights to the stadium. The naming deal is worth $220 million over 25 years. 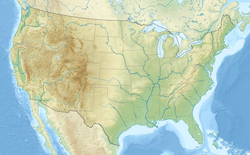 On May 20, 2014, the NFL awarded Minneapolis Super Bowl LII, beating out bids by Indianapolis and New Orleans for the game. On November 14, 2014, the NCAA announced the stadium will host the men's basketball Final Four in 2019. In May 2015, Governor Mark Dayton announced a bid to host the College Football Playoff National Championship in 2020. However, on November 4, 2015, it was announced that the game was awarded to New Orleans. This was the first losing bid for a major sporting event offered to be held at the stadium. On July 20, 2016, it was announced that U.S. Bank Stadium and Minneapolis would host the 2017 and 2018 summer X Games. The first NFL game at the stadium was the Week 3 preseason game against the San Diego Chargers on August 28, 2016. Although the Vikings scored first with a field goal, the Chargers scored the first touchdown in the new stadium. The Vikings ultimately won, 23–10. The first NFL regular season win at the stadium was on September 18, 2016 by the Vikings against the Green Bay Packers by a score of 17-14. The AMA Motocross Championship hosts a round at U.S. Bank Stadium since 2017. The Metrodome had last hosted an AMA Supercross round in 2013. U.S. Bank Stadium hosted its first playoff game, an NFC divisional game, on January 14, 2018, as the Vikings hosted the New Orleans Saints. The Vikings won the game 29-24 on a last second 61-yard catch by wide receiver Stefon Diggs, in a play that became known as the Minneapolis Miracle. The Vikings then advanced to the NFC Championship game against the Philadelphia Eagles in Philadelphia’s Lincoln Financial Field, where the Vikings lost 38-7, costing the Vikings the chance to become the first NFL team to play a Super Bowl in its own home stadium. Super Bowl LII was played at the stadium on February 4, 2018 between the Philadelphia Eagles and the New England Patriots with the Eagles winning 41-33 for their first Super Bowl win. The Vikings said the design includes a soccer field measuring 115 by 74 yards to accommodate a potential Major League Soccer expansion team. In 2012, the Vikings received a five-year window to host a Major League Soccer team in the state's legislation to finance the stadium, and the Vikings ownership launched a bid to own an expansion franchise. In December 2014, Vikings Vice President Lester Bagley presented rendering of the stadium configured for a potential Major League Soccer team, with tarps and curtains covering the upper deck to bring the capacity down to 20,000. He said the stadium was "being built specifically with soccer in mind" and drew a contrast with Gillette Stadium, New England Revolution's home field, which he called "a football stadium". On March 16, 2015, the Vikings announced they ended their expansion bid after MLS informed them that they preferred the bid by Minnesota United with its own plan for a smaller, outdoor stadium in Saint Paul. The first soccer match at U.S. Bank Stadium was between AC Milan and Chelsea FC on August 3, 2016, as part of the 2016 International Champions Cup. As with the Metrodome, the new stadium will have the capability to host baseball games in the winter months. The University of Minnesota will play selected games, primarily during February and March, including hosting the Dairy Queen Classic, a non-conference series of games featuring top NCAA teams in Minnesota that was suspended during stadium construction. The stadium's first baseball game was between Century College and Iowa Central on February 24, 2017. The University of Minnesota were scheduled to play the first baseball game at the new stadium, but converting it from Supercross to baseball took stadium officials longer than projected. Minnesota ended up playing Seattle University later on that same day as the third game at the stadium, first indoor home game for the university since the Metrodome. As part of the opening weekend festivities for the stadium, two concerts were held: country artist Luke Bryan on August 19, 2016, and heavy metal band Metallica performing the following night, August 20. Prince, a Minneapolis native, was in preliminary talks to perform the first concert at the new stadium in August 2016, but he died on April 21. July 30, 2017 Guns N' Roses Deftones Not in This Lifetime... Tour 48,740 / 48,740 $5,567,052 First time that original band members Axl Rose, Slash and Duff McKagan played in Minnesota together since 1992. Charli XCX Taylor Swift's Reputation Stadium Tour 98,774 / 98,774 $10,242,024 This is the highest attended event at the stadium to date. ^ "Stadiums by the Numbers". Minnesota Vikings. Retrieved August 17, 2016. ^ a b Murphy, Brian (July 31, 2016). "U.S. Bank Stadium: What It cost and By the Numbers". St. Paul Pioneer Press. Retrieved January 18, 2018. ^ "2018 Minnesota Vikings Media Guide" (PDF). Minnesota Vikings. 2018. pp. 2, 6. Retrieved August 31, 2018. ^ Halter, Nick (April 7, 2019). "Final Four games bring another dose of drama to U.S. Bank Stadium Saturday night (gallery)". www.bizjournals.com. American City Business Journals. Retrieved April 11, 2019. ^ Peters, Craig (May 10, 2016). "9 Things to Know about Vikings New Turf at U.S. Bank Stadium". Minnesota Vikings. Archived from the original on June 13, 2018. Retrieved February 8, 2018. ^ Meryhew, Richard; Walsh, Paul (December 3, 2013). "Vikings Ceremonially Break Ground on New Stadium". Star Tribune. Minneapolis. Retrieved December 13, 2013. ^ a b "Wilfs pledge $19.5M more to stadium". ESPN. March 26, 2015. Retrieved March 27, 2015. ^ DePass, Dee (January 18, 2013). "Vikings Stadium Engineering Firms Reflect Diversity". Star Tribune. Minneapolis. Retrieved February 5, 2013. ^ Meryhew, Richard (August 3, 2012). "Madison Firm Gets Job to Oversee Construction of Vikings Stadium". Star Tribune. Minneapolis. Retrieved February 5, 2013. ^ Vomhof, Jr., John (October 26, 2012). "Thornton Tomasetti Selected as Structural Engineer for Vikings Stadium". Minneapolis/St. Paul Business Journal. Retrieved February 5, 2013. ^ "Metropolitan Sports Facilities Authority Regular Meeting" (PDF). Minnesota Sports Facilities Authority. January 18, 2013. p. 3. Retrieved March 18, 2013. ^ Meryhew, Richard (February 15, 2013). "Vikings Pick the Home Team -- Mortenson -- to Build New Stadium". Star Tribune. Minneapolis. Retrieved March 18, 2013. ^ "Metrodome Next". Metropolitan Sports Facilities Commission. Archived from the original on February 10, 2010. Retrieved March 15, 2010. ^ Gibbs, Thom (September 19, 2016). "Minnesota Vikings salute heroes old and new in US Bank stadium win over Green Bay Packers". Daily Telegraph. Retrieved October 1, 2016. ^ a b Patra, Kevin (May 20, 2014). "Super Bowl LII Headed to Minnesota". National Football League. Retrieved May 20, 2014. ^ "Vikings Unveil Design of New Stadium". ESPN. May 14, 2013. Retrieved December 13, 2013. ^ Quintal, Becky (March 26, 2016). "U.S. Bank Stadium: A Game-Changing, Multi-Purpose NFL Stadium". Architecture Daily. Retrieved September 17, 2016. ^ Newcomb, Tim (January 16, 2016). "The Roof That Isn't There". Popular Mechanics. Retrieved June 23, 2016. ^ a b Thoet, Alison (March 1, 2017). "Flocks of birds perish by crashing into new Minnesota Vikings stadium". PBS. Retrieved January 31, 2018. ^ Peter, Josh (January 30, 2018). "Site of Super Bowl LII is a death trap for birds". USA Today. Retrieved January 31, 2018. ^ Shipley, John (August 12, 2016). "U.S. Bank Stadium Ugly on the Outside, Awesome on the Inside". St. Paul Pioneer Press. Retrieved October 12, 2016. ^ Vondracek, Christopher (September 23, 2016). "What nickname should we give US Bank Stadium? [POLL] | City Pages". City Pages. Retrieved October 12, 2016. ^ "Los Ventanales del U.S. Bank Stadium". 4ta & Gol (in Spanish). October 12, 2016. Retrieved October 12, 2016. ^ McCoy, David. "'An Engineering Feat': The Doors At U.S. Bank Stadium". Retrieved October 12, 2016. ^ "New Vikings Stadium Facts and Figures". Minnesota Vikings. May 13, 2013. Retrieved December 3, 2013. ^ "2016 NFL Attendance Data". Pro Football Reference. Last modified 2017. Retrieved October 27, 2017. ^ Scheck, Tom (November 20, 2006). "Anoka County Walks Away From Vikings' Plan". Minnesota Public Radio. Retrieved November 20, 2006. ^ Weiner, Jay (November 17, 2009). "As Interim Solution, Stadium Commission Offering New Deal to Keep Vikings in Dome". MinnPost. Retrieved December 23, 2009. ^ a b c d e f Anderson, Jr., G. R. (January 3, 2007). "Eye of the Beholder". City Pages. Archived from the original on |archive-url= requires |archive-date= (help). Retrieved January 3, 2007. ^ Scheck, Tom (February 18, 2002). "Committee Kills Vikings Stadium Plan". Minnesota Public Radio. Retrieved March 18, 2013. ^ Borzi, Pat (August 19, 2005). "Vikings'new Owner Makes a Name for Himself". The New York Times. Retrieved December 23, 2009. ^ Delaney, Kevin; Eckstein, Rick (February 2008). "Local Media Coverage of Sports Stadium Initiatives". Journal of Sport & Social Issues. 32 (1): 72–93. doi:10.1177/0193723507311674. Retrieved December 23, 2009. ^ a b c Levy, Paul (June 21, 2007). "Vikings, Star Tribune Close Land Deal". Star Tribune. Minneapolis. Retrieved June 21, 2007. ^ a b c Levy, Paul (April 19, 2007). "Vikings Stadium: Great View, But Who Pays?". Star Tribune. Minneapolis. Retrieved April 17, 2007. ^ "The Plan's Key Ingredients". Star Tribune. Minneapolis. April 19, 2007. Retrieved April 19, 2007. ^ Peterson, David (April 19, 2007). "Urban Planners See Sketches As First Step". Star Tribune. Minneapolis. Retrieved April 19, 2007. ^ a b c "Cost Comparison". Star Tribune. Minneapolis. April 19, 2007. Retrieved April 19, 2007. ^ Levy, Paul (June 22, 2007). "Stadium Could Cost $1 Billion". Star Tribune. Minneapolis. p. B2. Retrieved November 14, 2017. ^ a b Levy, Paul (May 19, 2007). "No Vikings Stadium Bill Now, But Next Year, Maybe?". Star Tribune. Minneapolis. Archived from the original on May 23, 2007. Retrieved December 13, 2013. ^ Davis, Michael; End, Christian M. (n.d.). "A Winning Proposition: The Economic Impact of Successful NFL Franchises" (PDF). Economic Inquiry (planned) via Copley Press. Retrieved October 4, 2008. ^ a b c Stetz, Michael (October 4, 2008). "Winning Football Season is Found to Convert Into Cash". San Diego Union Tribune. Copley Press. Retrieved October 4, 2008. ^ Vomhof, John (September 26, 2008). "Commission Picks Designers for Metrodome Project". Minneapolis/St. Paul Business Journal. Retrieved September 28, 2008. ^ Weiner, Jay (September 26, 2008). "New Vikings Stadium: High Drama at Stadium Commission". MinnPost. Retrieved September 28, 2008. ^ a b Bakst, Brian (December 18, 2009). "New Vikings Stadium Proposal: $870M, No Pay Plan". Google News. Associated Press. Retrieved December 23, 2009. ^ Erskine, Chris (December 13, 2010). "Metrodome Roof Collapse Had to Be a Sign From Above". Los Angeles Times. Retrieved December 14, 2010. ^ Borzi, Pat (December 14, 2010). "With Their Dome Deflated, the Vikings Still Need a Home". The New York Times. Retrieved December 14, 2010. ^ Kaszuba, Mike (December 17, 2010). "Dayton Meeting with NFL Commissioner". Star-Tribune. Minneapolis. Retrieved December 17, 2010. On December 26, 2010 the Zigi Wilf the Vikings owner agreed to accept an outdoor stadium. ^ Duchschere, Kevin (May 5, 2011). "Vikings' Stadium Options Narrow". Star Tribune. Minneapolis. Retrieved May 5, 2011. ^ Duchschere, Kevin; Olson, Rochelle; Brandt, Steve (May 9, 2011). "Minneapolis Kicks Off $1 Billion Stadium 'Game Changer'". Star Tribune. Minneapolis. Retrieved December 13, 2013. ^ a b Lambert, Brian (May 11, 2011). "Plenty of Doubts Ramsey County Can Pull off Stadium Deal". MinnPost. Retrieved May 12, 2011. ^ a b Duchschere, Kevin (May 10, 2011). "Ramsey County Vikings? $1 Billion Stadium Agreement Says Yes". Star Tribune. Minneapolis. Retrieved May 10, 2011. ^ a b "Vikings, Ramsey Co. Announce Stadium Deal". Star Tribune. Minneapolis. Associated Press. May 10, 2011. Retrieved May 10, 2011. ^ "Gov. Dayton, Legislative Leaders, Minneapolis, & Vikings Announce Stadium Agreement" (Press release). Minnesota Vikings. March 1, 2012. Retrieved March 1, 2012. ^ Dyste, Leslie (February 15, 2013). "Vikings to Play 2 Cold Seasons at TCF Bank Stadium". KSTP. St. Paul. Retrieved March 18, 2013. ^ Goldstein, Tom (March 4, 2012). "New Vikings Stadium Proposal Isn't For The People". City Pages. Retrieved March 4, 2012. ^ Ozanian, Mike (May 23, 2012). "Minneapolis City Council President Uses Bizarre Math To Push New Stadium For Vikings". Forbes. Retrieved May 25, 2012. ^ "Chapter 299 - Minnesota Session Laws". Retrieved August 31, 2016. ^ Hall, Brian (May 10, 2012). "Vikings Stadium Approved by State Lawmakers". Fox Sports North. Retrieved May 10, 2012. ^ Roper, Eric (May 25, 2012). "Stadium Gets Final Sign-Off". Star Tribune. Minneapolis. Retrieved May 25, 2012. ^ "Minnesota Vikings, University of Minnesota sign multi-million-dollar contract for use of TCF Bank Stadium". Twin Cities Daily Planet. Retrieved February 22, 2017. ^ "Vikings Stadium Authority Hits Back at Lawsuit". ABC News. Associated Press. January 15, 2014. Retrieved January 15, 2014. ^ "Supreme Court Tosses Lawsuit Over Stadium Funding". WCCO. Minneapolis. January 21, 2014. Retrieved February 11, 2014. ^ "Minnesota Financial Report November 2012" (PDF). Minnesota Management and Budget. Retrieved April 28, 2013. ^ "February 2012 Forecast" (PDF). Minnesota Management and Budget. Retrieved April 28, 2013. ^ Meryhew, Richard (April 9, 2013). "Time for a Plan B for Vikings Stadium Financing?". Star Tribune. Minneapolis. Retrieved April 28, 2013. ^ Grow, Doug (May 31, 2013). "Vikings Stadium Backup-Funding Controversy: General Funds or Not". MinnPost. Retrieved December 13, 2013. ^ "Taxes to pay for now-open U.S. Bank Stadium rebound, thanks to gamblers". Retrieved August 31, 2016. Tax revenues from pulltabs and other charitable gambling, the original source of money to cover the state’s contribution to the $1.1 billion public-private partnership — the largest in Minnesota history — are soaring. That’s a reversal from just a few years ago after botched projections forced the state to tap corporate taxes to help pay for the project. ^ Meryhew, Richard (August 31, 2012). "Bids Are in on Vikings Stadium Project". Star Tribune. Minneapolis. Retrieved August 31, 2012. ^ Nelson, Tim (September 7, 2012). "Architects Make Pitches for Vikings Stadium Contract". Minnesota Public Radio. Retrieved September 7, 2012. ^ Meryhew, Richard (September 28, 2012). "Dallas Firm Chosen to Design Viking Stadium". Star Tribune. Minneapolis. Retrieved September 28, 2012. ^ Keller, Tracy (October 17, 2012). "Minnesota Vikings to Build New Stadium for Team, Fans, Community". Concordia University. Retrieved October 17, 2012. ^ Olson, Rochelle; Jany, Libor (August 27, 2015). "1 Worker Dead, 1 Injured in Fall from Roof at Vikings Stadium". Star Tribune. Minneapolis. Retrieved August 31, 2015. ^ "U.S. Bank Stadium Construction Update". Minnesota Vikings. February 11, 2016. Retrieved February 11, 2016. ^ Olson, Rochelle (June 16, 2016). "U.S. Bank Stadium Contractor Mortenson, Subcontractor Face Fines of $173,000 in Death, Injury of Roof Workers". Star Tribune. Minneapolis. Retrieved June 16, 2016. ^ "U.S. Bank, Vikings Introduce "U.S. Bank Stadium" & 'Places To Play' Program". Vikings.com. June 15, 2015. Retrieved June 15, 2015. ^ Sinker, Howard (June 15, 2015). "Report: U.S. Bank to Get Naming Rights for Vikings Stadium". Star Tribune. Minneapolis. Retrieved June 15, 2015. ^ Verges, Josh (November 14, 2014). "Minneapolis: New Vikings Stadium to Host Final Four in 2019". St. Paul Pioneer Press. Retrieved February 6, 2015. ^ Eccher, Marino (May 7, 2015). "Minnesota bids to host 2020 college football championship". St. Paul Pioneer Press. Retrieved May 8, 2015. ^ Rayno, Amelia (November 4, 2015). "Minneapolis sacked by New Orleans in college football title game bidding". Star Tribune. Retrieved November 4, 2015. ^ "Frequently Asked Questions". vikings.com. Retrieved August 31, 2016. ^ Greder, Andy (March 14, 2015). "Report: Minnesota United FC to Be MLS Franchise". St. Paul Pioneer Press. Archived from the original on May 25, 2015. Retrieved August 31, 2016. ^ Rand, Michael (December 3, 2014). "First Look: Renderings of Vikings Stadium Outfitted for Major League Soccer". Star Tribune. Minneapolis. Retrieved August 31, 2016. ^ Brackin, Dennis; Olson, Rochelle (March 17, 2015). "Minnesota a Major Step Closer to Getting an MLS Team". Star Tribune. Minneapolis. Retrieved March 17, 2015. ^ Olson, Rochelle (August 4, 2016). "First packed house puts U.S. Bank Stadium to the test". Star Tribune. Minneapolis. Retrieved August 31, 2016. ^ "Minnesota Baseball Tours U.S. Bank Stadium". Retrieved August 31, 2016. ^ Christensen, Joe (February 24, 2017). "Take me into the ballgame: U.S. Bank Stadium makes its baseball debut". Star Tribune. Minneapolis. Retrieved February 24, 2017. ^ "Luke Bryan - U.S. Bank Stadium". Retrieved August 31, 2016. ^ "Metallica - U.S. Bank Stadium". Retrieved August 31, 2016. ^ "Prince was in talks for an Aug. 13 concert at U.S. Bank Stadium". Star Tribune. Minneapolis. May 10, 2016. Retrieved June 19, 2016. 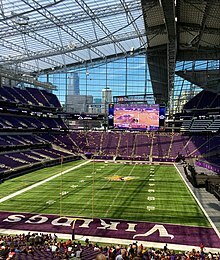 Wikimedia Commons has media related to U.S. Bank Stadium.